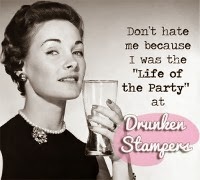 I know, I know.....it's Friday and I don't have a "Funny Friday" again.....um...maybe next week! I used a couple of SU images on here - Simply Soft for the image and Watercolor Trio for the sentiment. Just about all the supplies used on this card are from SU. I did a little sponging around the edges with some distressed ink and colored the flowers with Copics. The ribbon got a little wonky on one side - but hey, what can I say....it just seemed to flop down as I took the photo! 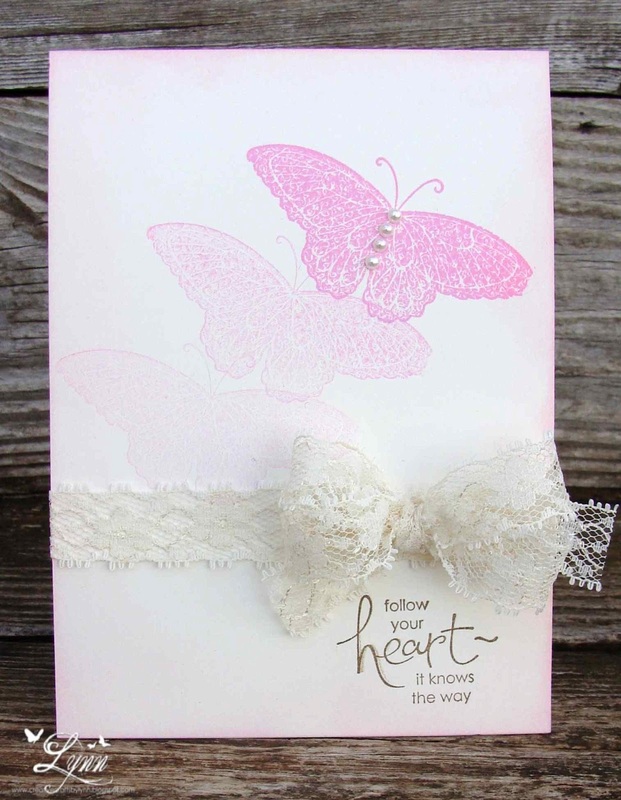 The pink background was embossed with the Stripes folder but you can just barely see that in the photo. 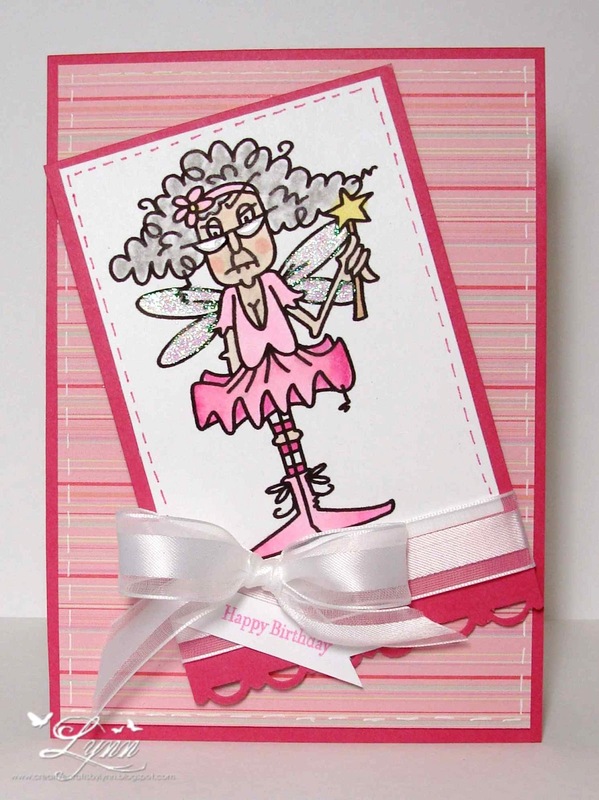 I'm just about to give up on photographing any card that has pink on it!!! Everything looks so washed out in the photos! Anyway, thanks for stopping by...............and have a great weekend! NO........This card is NOT what you think! I just thought it was a little catchy to see "the birds and the bees"...Actually, it's the birds, bees, and butterfly!! LOL In case you're wondering where the birds are, they're on the embossed panel - you just have to look close! 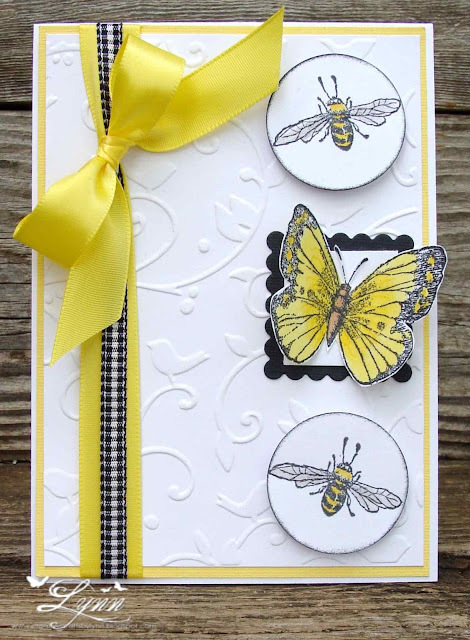 A quick, CAS card for today with a little yellow, white and black to get everyone in the mood for spring! We have the garden all in now - way too much work and a very sore back, but it's finally done. Now we get to sit back and watch it grow - and then all the work really begins, with canning, etc.... We already have butterflies though - just not the bees yet. In fact, some type of little yellow butterfly must be migrating though here right now as there are hundreds of them! The card is pretty self explanatory.....I added some Liquid Glass to the wings of the bees and used a yellow Sakura pen to highlight some on the butterflies wings. 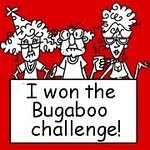 I'll enter this is the challenges at Tuesday Morning Sketches (Sketch - be sure and check out their blog to see this) and Tuesday Throwdown (Outside the Box). 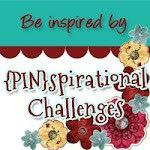 It's time again for another challenge over at Creative Belli blog! 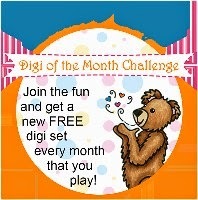 Our challenge for the next two weeks is themed Three Shapes. 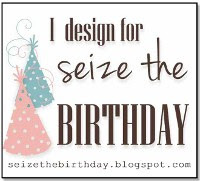 Be sure and head on over to the Belli blog and check out all the wonderful creations by the Design Team. Remember, in keeping with the spirit of the Belli challenge, use your old and forgotten embellishments. 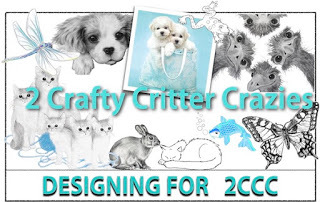 Enter your creation and who knows, you could be our next Guest Designer. 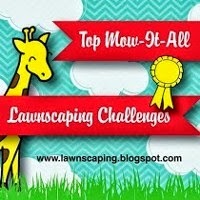 For some reason this was a very hard challenge for me!! I mean, come on....three shapes! Sounds easy enough but I kept coming up with a design for either two shapes or four shapes! LOL! I finally ended up with this card. Three shapes - rectangle, heart, oval. After completing my card, I decided to reverse the colors and see what happened. 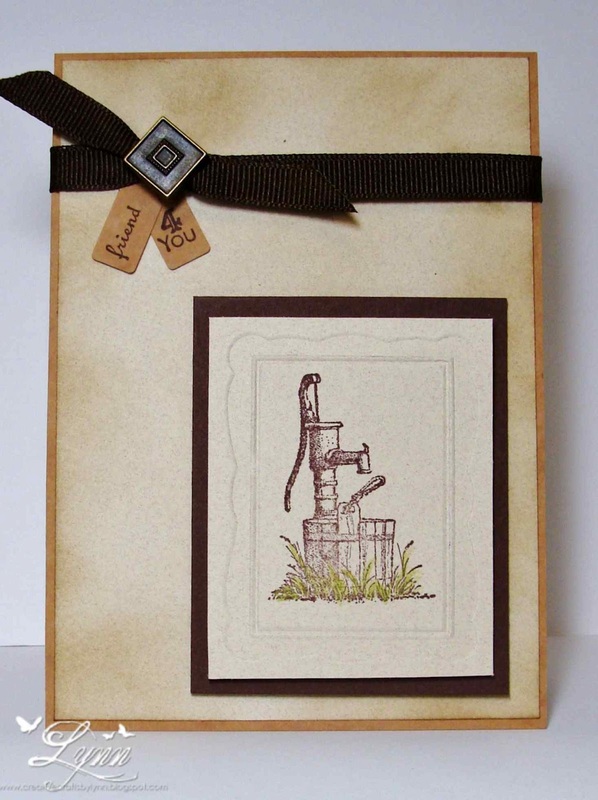 I didn't drag out my sewing machine on this card though. Pretty CAS but think they'll be great for OWH - no worry about difficult mailing of these. 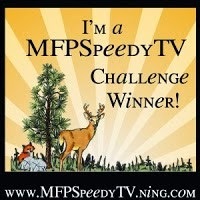 Thanks for stopping by and be sure and check out the Belli Challenge. I have a couple of things going on here....first of all, this is one of those adorable images from Dude Time Doodles and I'm going to enter it in their Inspiration Challenge this week. It's all about cowboys! Being from Texas, I do love my cowboys for sure! There's just something about the jingle of their spurs and the swish of the chaps that sets the heart a-flutter! LOL! And believe it or not, we actually do see guys (and gals) in town and at the stores with their spurs on! I usually just leave mine at home!!! This is also my card for CASEing Marilyn. 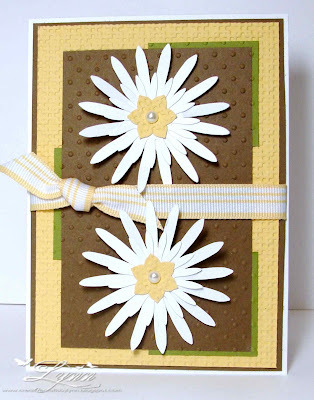 The SCS Stamp Addicts group I belong to are CASEing each others cards and up this week is Marilyn. 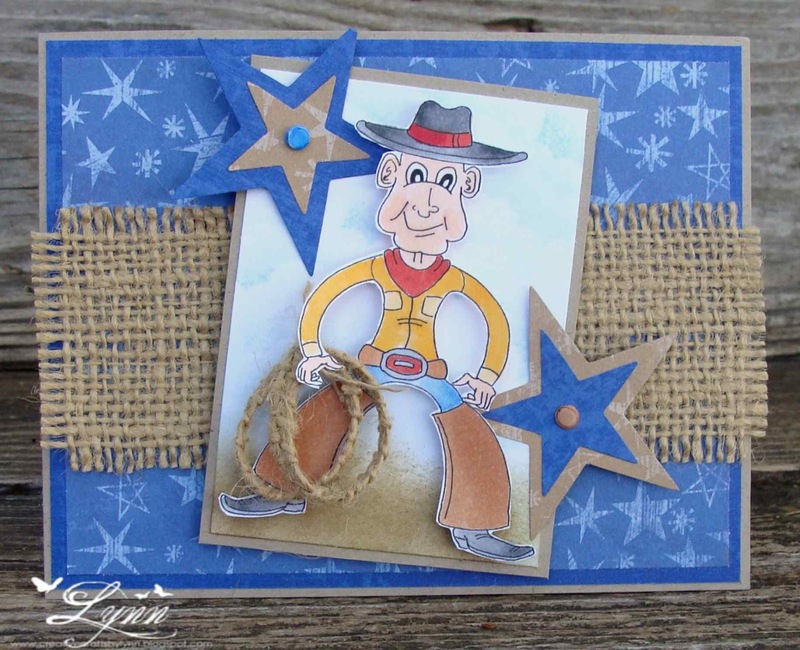 Marilyn always creates gorgeous cards with beautiful coloring, flowers, and paper.....um...so where did I come up with this dude!!! Well, back in September she had the cutest card on her blog with a little boy viewing a frog - so I went with her general design and a guy type card. 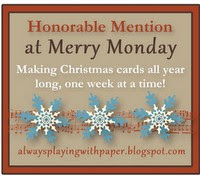 You can see Marilyn's card here. 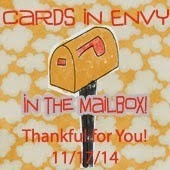 NOTE: If you're having trouble viewing the card, just go to Marilyn's blog and it's from Sept. 6, 2011. 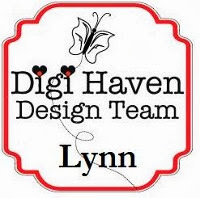 Be sure and check out all her wonderful creations on her blog! 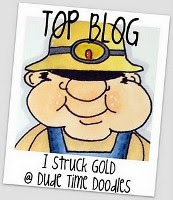 As I said, the image is from Dude Time Doodles. I sponged in the sky and used some CTMH DP on this and the stars were cut using a die. 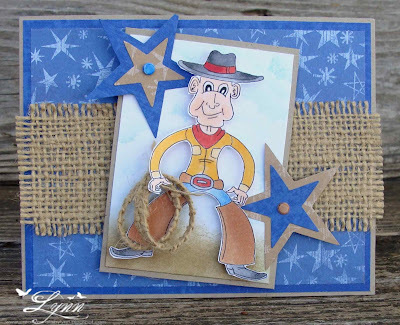 I added the burlap behind the image and cut off the selvedge to create his little rope. 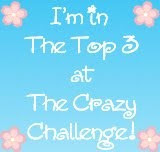 I'll also enter this in challenge at For Fun Challenges (Wild Wild West), and Crafting When We Can (One for the Boys). 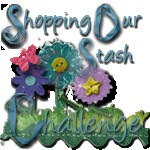 Every week, Lesley, over at Always Playing with Paper blog has a Merry Monday challenge - and each week I say I'm going to play along......and then get side tracked on something else! So this week, I finally decided I would just DO IT! 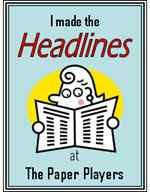 She has a very easy sketch to work with this week so be sure and check it out. I don't think it's ever too early to make Christmas cards....and now I have two more for my stash. 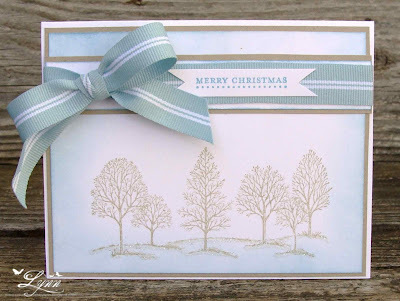 On both cards I used the Lovely as a Tree set from SU. 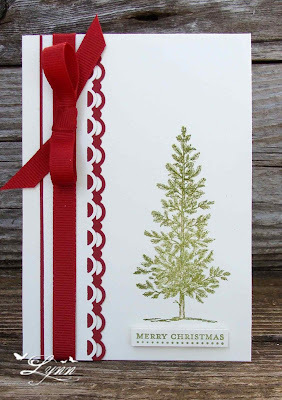 On the first one I stamped the tree in Certainly Celery and then again in Old Olive. I added some Iridescent Ice and then heat embossed....it really shines but you can't see it in the photo. 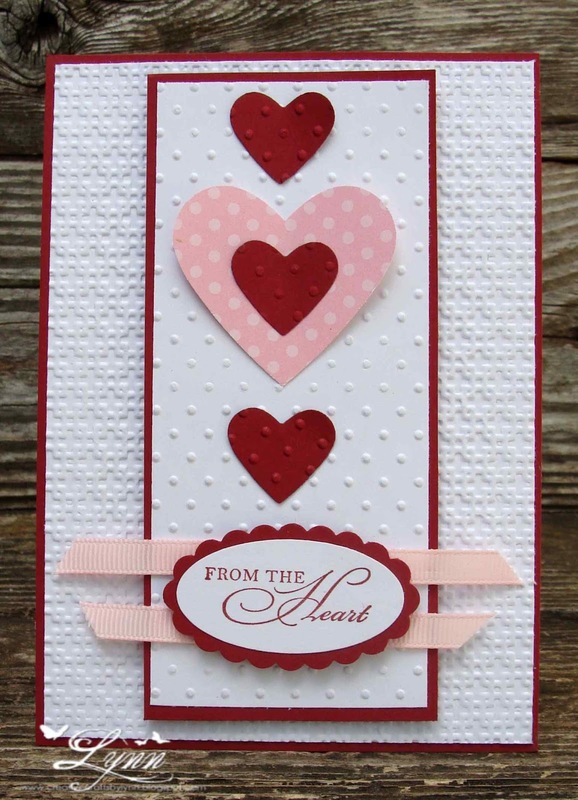 The sentiment is popped up on dimensionals and the border double punched. 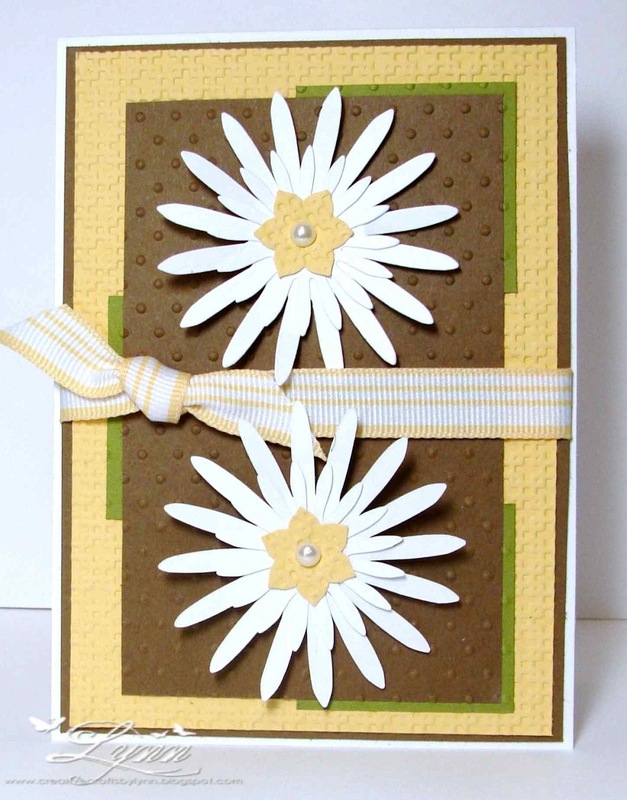 What's really weird about this card is that it was done in Very Vanilla card stock - yet looks REALLY WHITE in the photo! On the second card, I sponged around the white with Baja Breeze, matted it on Kraft, and then stamped the image in Crumb Cake. I added glitter to the base of the trees - but there again, you can't really see it in the photo. 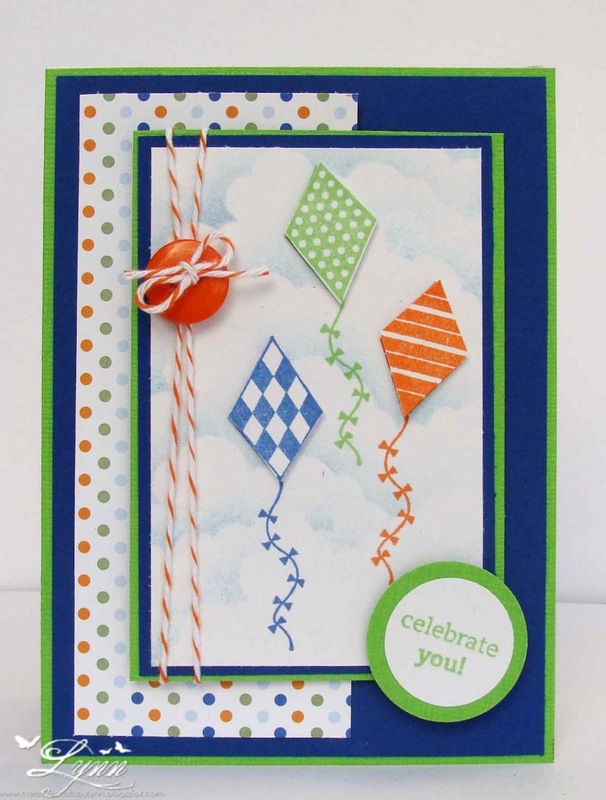 I then added the Baja Breeze ribbon and sentiment. This card is really so much prettier in real life. Thanks for stopping by............and have a great weekend. I'm still not real sure where I thought I was going with this card. 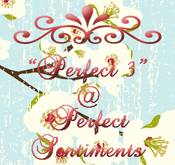 I probably had something very creative in mind, but....well, you know! LOL! Anyway, after it was all said and done, I actually kind of like it. At least I like the ribbon and believe that's the first thing I grabbed when I started this. Just a note - and a little different. The last couple of days have just been crazy around here. On Sunday, all the company left (YES!) and then that night we had either a twister or tornado hit - blew a lot of shingles off the house and scattered limbs, lawn furniture, and anything else that wasn't nailed down, all over the country! Yesterday was spent cleaning up around here and my husband and a roofer got up on the roof and patched it since we were suppose to have more bad weather last night! And bad it was.....but thankfully, the brunt of it missed us. Several towns in the area had tornadoes and there was so much damage. My heart goes out to those that lost so much. 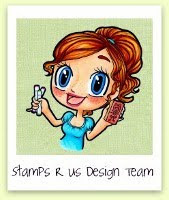 A week or so ago I saw the sketch at Freshly Made Sketches and picked out my stamps (Send Me Soaring by SU), paper, etc. 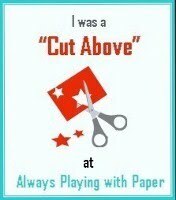 and created this card. I never got it posted to go in the challenge there but thought I'd show it to you now. What was really funny about the whole thing though is that I completed my entire card and then was scooting around my Google Reader to see all the wonderful inspiration and came across a card that Anne Marie had done that was almost exactly like mine!! She did hers in different colors but other than that, they could almost be twins! 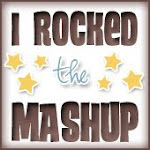 Check out Anne Marie's blog to see what I'm talking about! 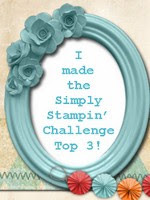 I'll enter this in this challenges at Scrappy Frogs (Seeing Spots), Stamptacular Sunday (Cute as a Button), Simply Create Too (Spring), 2 Sisters Challenge (Spots n Dots), and Pile it On (Up in the Air). 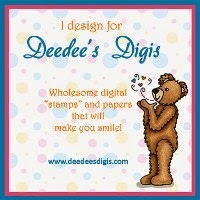 Y'all don't want me to bore you with all the details on this card, so I'll just say - KEEP SMILING!! Thanks for stopping by........and have a wonderful weekend. I'll check in on everyone's blog on Sunday. 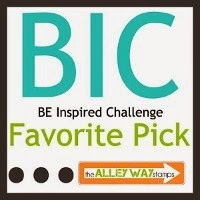 It's time again for the Creative Belli Challenge! 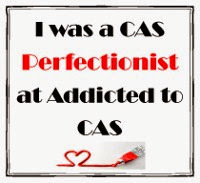 Our theme for this challenge is CAS (Clean and Simple). 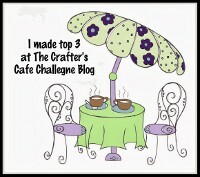 CAS cards seem to be very popular these days so come on over and join this fun challenge. Who knows, you may be our next Guest Designer! In keeping with the spirit of the Belli Challenge please remember to use your old and forgotten embellishments. My card didn't start out looking anything like it does now....I'm not even sure what I was doing, but I think I started to stamp something and them messed it up (shocking, isn't it!) and then just started going with it from there. The butterfly image is from Strength and Hope and the sentiment from Whimsical Words - both from SU. If you'll notice, the right wing of that butterfly has the tip chopped off.....um...the image is not like that but when I stamped it, it somehow got chopped - the only good thing is that all three image are chopped! LOL! But, the bottom line is, how many times have you ever seen a perfect butterfly anyway!! The lace is from one of my thrift store trips....just never know what you'll find in those places. We've got company coming tomorrow so I'll be away for the computer until Sunday. 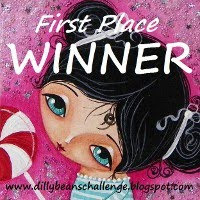 Thanks for stopping by..........and be sure and check out the Belli Challenge. A blogging group that I belong to on SCS has started CASEing each others card - just a little something to keep us inspired. 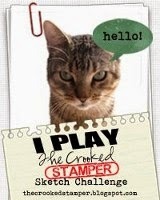 We're CASEing Shelly over at My Creative Rumblings this time. But there's just no way I could ever come up with some of the things she does.....she's a Technique Queen if there ever was one! Amazing creations! I decided to case a card she did last week where she used a technique called faux mosaic. 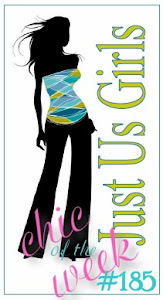 Check out her card here. Now I have no idea how she did this, but based my card on that patchwork look. I just pieced some DP's and then zig zagged around them. I used the same layout she did on her card and even added the tiny little tag - which by the way, says "You're the Greatest". And to top it off, I added the pink ribbon that I had won from some blog candy from Shelly not long ago and stuck a little hat pin in it that was some blog candy from Linda! 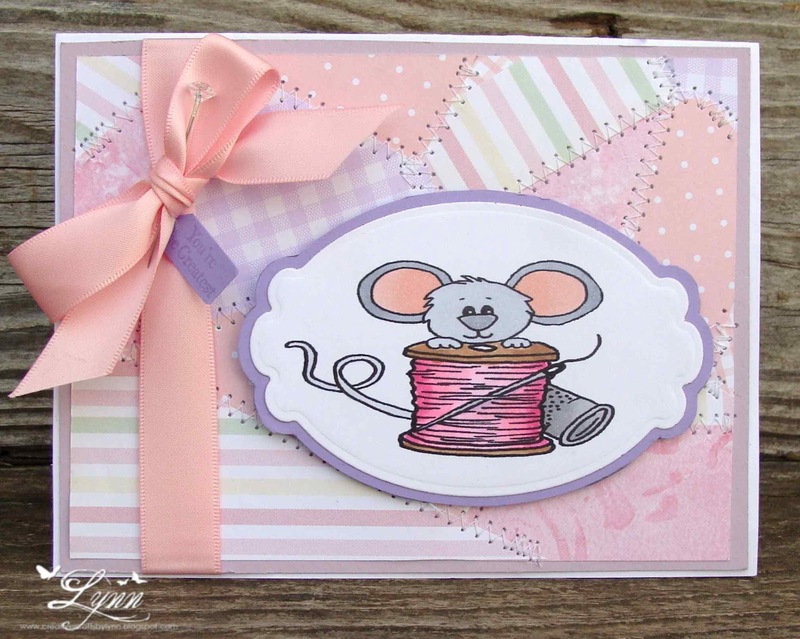 Why is SO hard for me to photograph a pink card and have it come out looking, well..... not pink! I can't remember the sketch I used for this - am sure it was for some challenge but never got around to doing it. Anyway, here you go.....inside and out. I had all these scraps of card stock, ribbon, and die cut flowers laying around on my craft table and decided it was time to get rid of them - so, made a couple of really quick card. I don't even like them - but DID get rid of some of the scraps. I'm really thinking not only has my mojo taken a vacation but it's taken my entire brain with it! This actually started out as a CASE of a card I saw on Pinterest....STILL hot sure where it went south! About the only thing that was CASEd were the flowers! 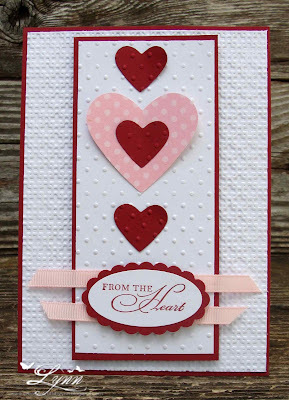 This is a monochromatic card that I thought I'd enter over at Less is More (neutral colors). 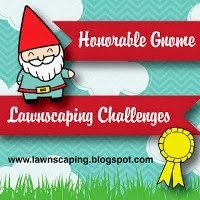 I did add a little green to that grass - but oh so wanted to put a big splash of yellow or red or something on it! LOL! 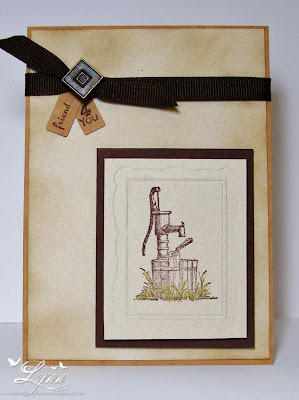 I'll also enter it in the challenge at Sweet Stamps (Monochromatic). I'm not real sure how I acquired all the buttons I have, but have way too many! I decided to use a bunch on this card to see what it was going to look like. 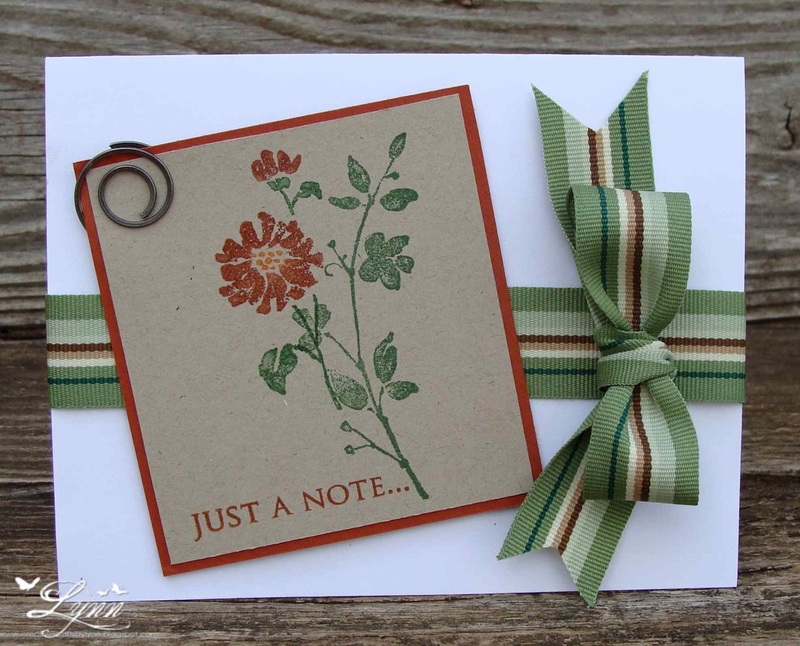 I started with the image from Stampendous and colored it with SU markers and then placed several buttons over the flowers. I stamped in the grass using an old SU set I had. 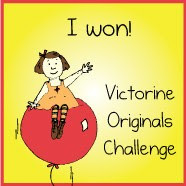 The sketch I followed is from My Time Made Easy and I'll enter it into their challenge. 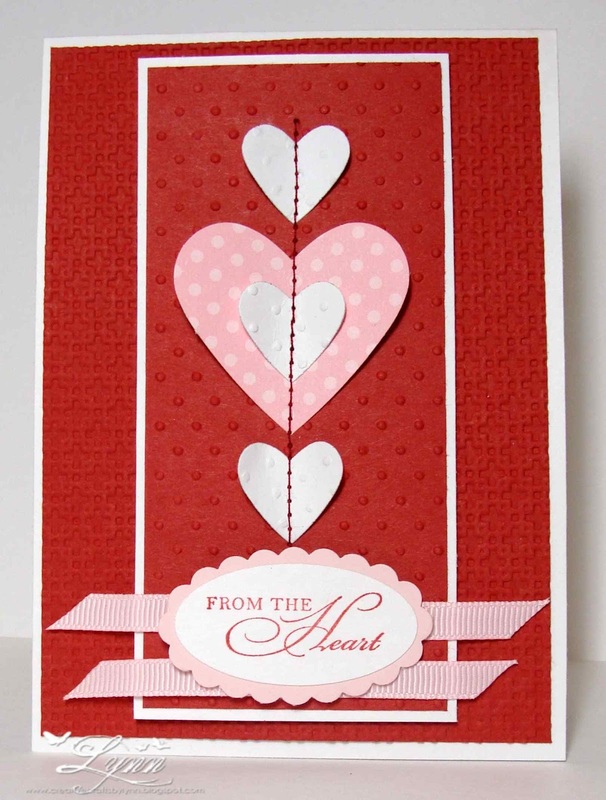 After finishing the card, I felt it needed something at the bottom - so added more buttons! 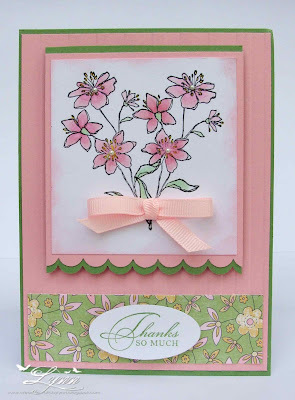 This turned into a very Spring-y looking card - and I'm so ready for Spring! Yep, same image and two different cards! 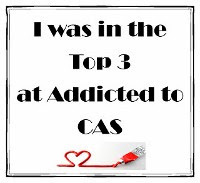 Both are CAS but were really fun to do. I used the You're My Type image from SU and did one in blue and one in pink. I did a different type of bow on the blue one - and the little rascal keeps flying apart! I'm going to have to work on that I'm afraid. I stamped the typewriter in Versa Mark, used black embossing powder, and then heat set. I actually sewed around the edges on the blue one but I did it in a light colored thread and you can't probably see it unless you click to make the picture larger....and I even sewed semi straight lines!!! 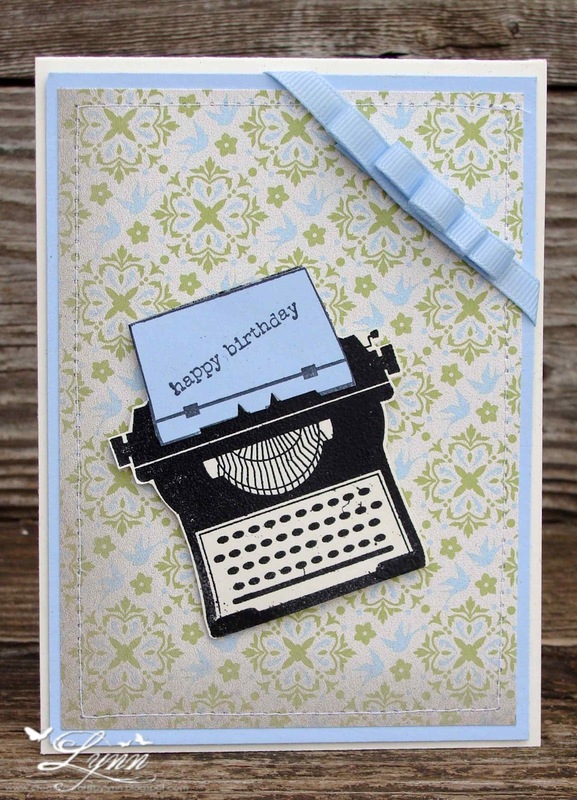 Ok how many out there in Blog Land remember this kind of typewriter??? Telling my age, but I actually learned how to type on one of these little jewels. 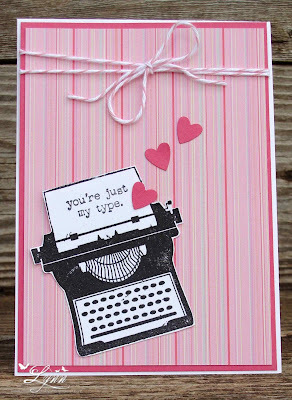 I was SO excited the first time I got to type on an electric typewriter - thought it was the best thing since sliced bread! Now we have computers.....just amazing!